Here we see data representing the global sales through to consumers and change in sales performance of the three home consoles over comparable periods for 2009, 2010, 2011 and 2012. 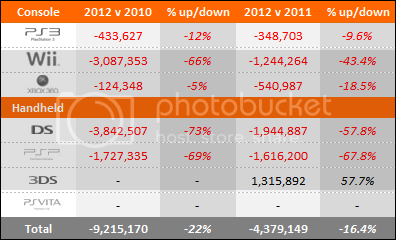 Also shown is the market share for each of the consoles over the same periods. 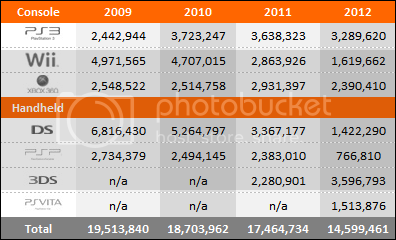 "Year to date" sales for 2009, 2010, 2011 and 2012 sales are shown in series at the top of the table and then just below a comparison of 2012 versus 2010 and 2012 versus 2011 is displayed. This provides an easy-to-view summary of all the data. The $99 360 appeals to the non-gamer who probably has/had a Wii for Wii Sports/Fit/Play/Resort and now wants Dance Central. Seems you put PSVita instead of Xbox 360 in the market share category. Wii really did reach it's peak in 2009. The PS3 is looking good, 360 isn't doing to bad either. Wii really is sinking thought in its sales, people had mentioned it was but I didn't realize the extent. The PS3 is on FIRE!!! Awesome!!! But I still think that the PS3 has already surpass the 360 numbers, or at least has the "same" numbers. I think that, because M$ would be bragging about how they are the second console worldwide, but what they always say is that they are the number 1 selling console on the US. On the Other hand Sony does not says that they are second, so what I think is the most probable scenario is that both consoles have a "technical" tie. If that is the case, Sony will surpass M$ by the next year. Yeah thats nice.... No reason to bash the 360's image though. curious to see how those numbers change after ms puts out the $99 xbox... I really don't understand who that appeals to at this point in its life cycle. Looks like PS3 grow was basically over Wii's Market share. Probably because it's decline in Japan.